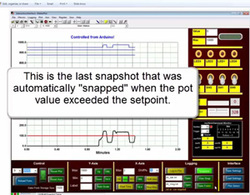 The Learn Video Tutorial Series is intended to get you deeper into the operation and functionality of the MakerPlot software and to show you how to program your micro in order to interact with it. Connecting to MakerPlot is simple and this video shows you exactly how to code your micro's firmware to do it. The firmware examples are done in the Arduino "C" type language, but it is simple enough to translate into any other language like Basic, Python, etc. 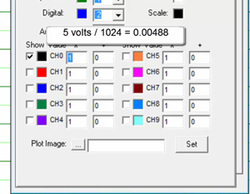 This video shows you how to use MakerPlot to scale your micro's ADC output values directly into equivalent voltage data without any pre-processing in your micro's firmware. MakerPlot can "scale" and "bias" up to 10 individual analog input signals using the Configuration Tab. You'll learn how it's done in this video. In these examples you're shown how to generate analog data by programming your micro and, also, by entering analog data manually into the Log Debug Immediate window. With MakerPlot's Log Debug Immediate function you're able to view and log an entire record of analog data from any compatible source...whether it's from your micro or from an instrument that outputs its own analog serial data. 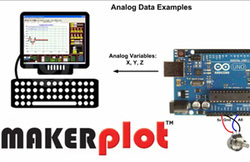 This video shows how to enter digital data into MakerPlot from both the Log Debug Immediate Window (manually) and from an Arduino UNO programmed to output similar data. 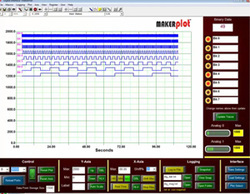 You're shown how MakerPlot logs the data in real time so that you can view it to detect errors or patterns in the data. Messages are a primary MakerPlot feature and this video shows you how to generate and display them in three ways. 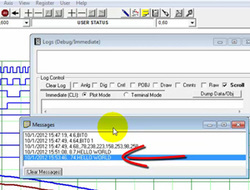 You'll be shown how to generate the familiar "Hello World" message and, also, be shown how to display real time analog and digital data in the messages areas. Messages are just one way to identify errors in your micro's data going to MakerPlot and to alert a user to critical conditions. This the first of a series of videos in the Learn series that demonstrate how code written for an Arduino UNO shield can be used to manipulate an analog sensor value that's controlled by a potentiometer. 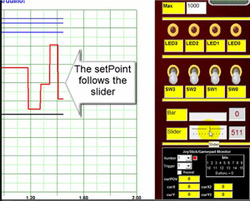 Two push button switches control the setpoint value and you are able to graphically see how the setpoint and potentiometer values change in MakerPlot. 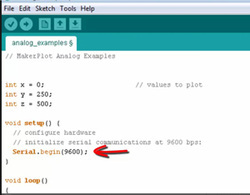 This video expands the Arduino Setpoint Example to include code that automatically "snaps" an image of the MakerPlot interface screen when the potentiometer voltage exceeds the setpoint. You will learn how to program your micro to send commands (other than just analog and digital data) to MakerPlot to control the operation of snapping an image. 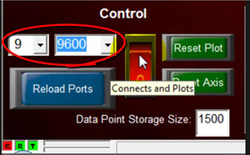 This video is a prerequisite to learning about bi-directional control (next). This is the first of a two part video that demonstrates bi-directional interaction between MakerPlot and your micro's firmware. In it, you'll learn the techniques of coding for interactive display and control of both the micro's firmware actions and MakerPlot. You'll be introduced to the "Interactive Interface" that allows your micro to directly control LEDs, toggle switches, sliders and more. And as an extension to the Arduino Setpoint Example video, our bi-directional control will cause MakerPlot to automatically "snap" an image of the interface screen when the potentiometer value exceeds the Setpoint value. It's something to see! Part 2 shows you how to use the "Interactive Interface" to control the setpoint value using MakerPlot's slider graphic. You'll learn how to code your micro to change the setpoint with the MakerPlot slider and, also, with the two push button switches on the Arduino Shield. 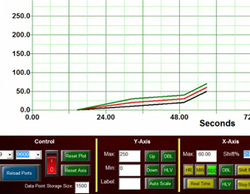 This is true interactive control that MakerPlot allows you to accomplish with your own projects.